Type 2 diabetes is the most common type of diabetes, affecting 85-90% of all people with this disease. Diabetes occurs where the pancreatic cells have increased resistance or reduced ability to respond to insulin and absorb glucose (sugar) from the blood into the muscle and fat cells to use for energy. 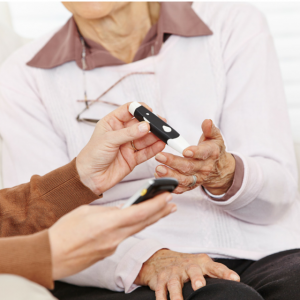 Usually affects older adults, type 2 diabetes is becoming more common in younger adults and teenagers. Type 2 diabetes normally occurs together with increased blood pressure, high blood cholesterol and increase body weight. The condition can be initially managed by a controlled diet and increased exercise. Some people will require oral medication and may eventually need to go on insulin therapy. Older (over 55 years of age). Over 45 years of age and are overweight. Over 35 years of age and are from an Aboriginal or Torres Strait Islander, from Pacific Island, Indian subcontinent or Chinese cultural background. In type 2 diabetes, many people have no symptoms at all so by the time it is diagnosed, the complications of diabetes may already be present. Itchy skin and increased infections. Eye disease- damage to the blood vessels behind the eye can cause vision impairment and blindness. Leg ulcers and serious foot problems. Maintaining a healthy weight with healthy food choices and regular exercise. Controlling blood sugar levels between 4-8mmol/L. Tablets to help regulate blood sugar levels. Insulin therapy in some cases. Diabetes can lead to increased risk of infection, sensation loss and reduced circulation, especially in the feet. The combination of numb, insensitive feet (neuropathy) and poor circulation means cuts or injuries may go unnoticed and progress to infected ulcers which may heal poorly. It is important to have a diabetes foot assessment every 3-12 months depending on your risk level by a podiatrist to prevent serious foot complications and ulcerations. The podiatrist at Well Heeled Podiatry will educate you on your foot health status. Education will be provided about monitoring for infection, diabetes and foot related risks. They will provide you with advice on daily diabetic foot care and preventative strategies for diabetic foot complications.